Click on the jump links below for the answers. How often should I brush my dog's teeth and why? My dog only eats dry food and chews on bones regularly, isn't this enough? How long does an anesthesia-free dental scaling take and can I watch? Aren't anesthesia-free dentals merely cosmetic and incredibly stressful for the dog? When should I bring my dog back for another cleaning? Why don't you offer a scheduled Maintenance Program so I won't have to brush my dog's teeth? What can I do to prepare my dog for a dental cleaning? Is every dog a candidate for an anesthesia-free dental? My dog HATES having teeth and nails done, what can I do? I'm afraid of anesthesia risks, what do you think? Why is the the American Veterinary Dental College (AVDC) so opposed to dental cleanings without anesthesia? Isn't what you are doing unethical and illegal? Do you train others to perform standing dentals? How can I find someone in my area that does anesthesia-free dental scaling and what should I look for in a qualified practitioner? What are the health risks of overgrown nails? I have always used clippers on my dogs nails, why do you prefer using a grinder? My dog gets plenty of exercise on concrete, isn't that enough? Wild dogs never get their nails trimmed, what about them? As often as necessary to keep the teeth free from plaque (which will harden/mineralize into tartar/calculus) and gums stimulated enough that they don't bleed when brushed. Toy breeds, breeds with long narrow muzzles, tight lips and/or dry mouths,breeds with wonky teeth (malocclusions) that don't meet in a scissor bite), and heavy mouth breathers, should have a couple of minutes of brushing daily. Depending on several factors, many dogs can get by with brushing every second or third day but all dogs will benefit from daily care and it's easier to remember if you make it a daily ritual. Why risk your dog's health by seeing what you can "get away with"? The general rule of thumb is this: Brush DAILY for excellent oral health. Brush every other day for only mediocre dental health. Brush every 3 days and you will probably get tartar formation. The first several times you miss a 3rd day of brushing the tartar won't be visible but it will be forming and given time, it will darken. Allowing bacteria ridden plaque and tartar to remaining at the gum line can lead to oral discomfort, abscess, bone loss and in advanced cases, bacteria can spread through the bloodstream and contribute to kidney, liver and heart damage. Scientific study has shown that that daily manual removal of plaque (brushing) will keep teeth in a clinically healthy condition (see my article on how to brush your dog's teeth for the link to the citation). Remember this the next time your vet does a routine anesthesia dental and advises not brushing for 2 weeks! In this situation I advise resuming gentle brushing in 2 days. When you are doing your part by brushing daily you are contributing to a smoother anesthesia-free dental process. I consider a cooperative approach between client, practitioner and veterinarian to be critical for successful lifelong optimized health for your dog. Safe bones (like natural raw chicken necks) and chew toys can help and there are several products on the market that can possibly contribute to your oral hygiene regime but nothing should be considered a reasonable substitute for daily gum stimulation and manual plaque removal with a brush. The average thorough dental will take 1-2 hours. Time is dependant on several factors including what stage of training your dog is at to accept the procedure and the level of tartar build up. I personally believe it's important that the dog understands that their owner has a positive attitude about the importance of dental cleaning procedures and find it useful for owners to see the level of calm firmness required to facilitate acceptance. On occasion some dogs will be more difficult to settle down and relax if they have a history of effective "arguments" with, or lack of respect for, their owner. Likewise, the owner who is lacking confidence and rushes in to sooth their dog for the slightest wiggle can create anxiety in their dog. I prefer to help the owner with the anxiety they are projecting on to their dog so they will be more successful with home care. The ideal observer will remain calm and somewhat emotionally detached and will not jump in to "help" verbally or physically unless requested. This kind of "assistance" can make the dog feel ganged up on and/or confused and includes the owner praising the dog when they think the dog is doing well. Why? Because the dog might actually be tense even though appearing still. The practitioner will praise the dog when he is fully relaxed. Aren't anesthesia-free dentals merely cosmetic and dangerous as well as incredibly stressful for the dog? They would be purely cosmetic, and dangerous to dog and practitioner, if the practitioner didn't have the skill to keep the dog calm, relaxed and steady while cleaning at and BELOW the gum line on top, bottom and inside teeth. Keep in mind, I do not do anesthesia-free cleanings on dogs with advanced periodontal disease and deep pockets. 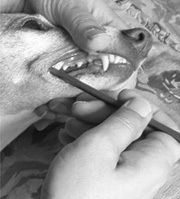 Just about anyone can be trained to use a curette on the sub-gingival areas while the dog is under anesthesia. To accomplish this while the dog is awake requires skill, natural talent and instinct to gain the dog's trust, something that can't be taught to just anyone for the price of tuition. Personally I considered any dental "merely" cosmetic if the owner isn't committed to sharing the responsibility for the dog's dental health. Dogs should never be bullied to get the teeth cleaned, that would be IDIOTIC and anyone who believes this is the only possible way to do an anesthesia-free dental is likewise idiotic, or doesn't really understand dogs. Dogs are firmly and patiently trained to relax for the procedure. Most will quickly realize that you are not hurting them and that it is futile to struggle if the practitioner is confident and using simple,effective restraining techniques. Ineffective restraining techniques only escalate panic and hysteria which is why many vet techs and vets are quick to get out a muzzle and call in reinforcements. Keeping a dog calm while restrained takes extra time, patience and skill. This will depend on your ability, dedication to home care and what condition your dog is in when you start proper home care. 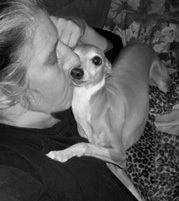 My 10 year old Italian Greyhound (a breed notoriously prone to gum disease due to their size and mouth structure), has only needed 3 minimal dental cleanings and has never required anesthesia for a dental. I advise check-ups at least twice a year but if you notice tartar formation sooner it would be a good idea to bring the dog in for a check up and tutorial so I can evaluate your brushing technique. Our mutual goal should be that your dog doesn't have a chance to develop tartar in the first place and to minimize the need for anesthesia dental cleaning. It is up to your own vet to inspect the dogs teeth during yearly wellness visits. Be sure to tell them that you are brushing the teeth daily so they can make an informed decision on how they want to evaluate oral health. Many vets will only quickly lift the lip to look for evidence of enough tartar to justify using anesthesia for a complete dental exam. Because this isn't really the best routine to follow for long term optimum health. If your dog is especially prone to gum disease and you aren't willing to do home care then you will probably be better off with regular anesthesia dental cleanings and extractions but don't fool yourself by thinking that you are doing the best you can for your dog. What can I do to prepare my dog for the first dental cleaning? Start by training your dog to relax and accept laying on his side while you confidently massage his body and move on to gently massage gums with your finger. So long as you have the dog down and relaxed, work on the feet and toes too! If the gums are very inflamed I will consult with the vet and you may be sent home to treat with chlorhexidine prior to the dental. Before the dental cleaning, allow time for the dog to digest it's previous meal and have an intensive exercise or training session with your dog. Giving the dog a "job" to think about can have a very calming effect. Check out the How To section of this website for more tips and details. No. If your dog is beyond stage 3 (moderate periodontal disease (PD3 with 25-50% support loss and deep pockets) or is in need of a dentistry procedure, such as extractions or tooth repair, an anesthesia dental is in order. If the dog is only at stage 2, early periodontal disease (PD2 with less than 25% support loss), we might opt to do an anesthesia-free dental and do a quick anesthesia to extract a very loose teeth or deal with a single bigger issue. If your dog is especially hysterical and difficult to safely restrain because of small size (micro miniatures or tea-cups) or head structure (flat faces and bulging eyes) we will evaluate your dog on an individual basis. Depending on mouth condition, we may suggest an initial anesthesia dental to give you a fresh start and/or work more gradually on training you and your dog. Most dogs can be trained to accept daily dental attention. Schedule a training session! Your dog doesn't have to love having his teeth brushed but can certainly learn to accept it. You might need to examine your own negative attitude. Daily affirmations of "This is GOOD!" and truly believing it, can actually help train your dog. I can show you how. I'm afraid of anesthesia risk, what do you think? Fear of anesthesia should not be the sole deciding factor when choosing to seek out the services of an anesthesia-free dental scaling practitioner. Anesthesia methods have become much safer but there will always be some risk involved. When your dog NEEDS to go under anesthesia to be kept still and pain-free for a necessary procedure you must do it and shouldn't be so afraid that you decline the procedure. I'm just saying that you shouldn't normalizing "routine" anesthesia dental cleaning when there is a reasonable alternative. Because there is always an element of risk with anesthesia most vets will advise waiting until the teeth are really bad before doing a cleaning. Allowing periodontal disease to advance is NOT in your pet's best interest. Ideally, your vet will find someone capable of doing anesthesia-free cleanings and work with their clients to improve home care before disease advances. Having had countless older Italian Greyhounds turned in for re-homing that had rotting mouths I will always insist on taking the risk of anesthesia rather than let them be slowly poisoned to death by oral bacteria and in considerable discomfort. Something to consider is the fact that as pack animals, dogs are hardwired to mask their pain. Weak members in pack societies are detrimental to the welfare of the group and are frequently "dispatched". By the time your dog finally "lets you know" they are feeling pain they are usually in agony. Why is the American Veterinary Dental College (AVDC) so opposed to dental cleanings without anesthesia? Their oppositions, which I will cover point by point, are just a part of their agreed upon official Position Statement. These positions are opinions and are not based on scientific evidence or study. Keep in mind that they are in the BUSINESS of training veterinary dental specialists and that effective anesthesia-free dental cleaning cannot be taught to just anyone and therefore is not easy to exploit financially. Ever hear of Conflict of Interest? Passing laws that make it illegal to clean dogs teeth unless under veterinary supervision was a good first step towards keeping a finger in the pie. What next? Make it illegal to brush your own dogs teeth? Lest you think I'm stretching to the point of ridiculous impossibility, let me remind you that there was serious consideration given to passing a law that would make giving canine nutritional advice illegal as it would be Practicing Veterinary Medicine Without a License. Ever wonder about Science Diet's Prescription Diets that are only available through veterinarians even though they are just a "therapeutic" recipe and not a medicine? Imagine if you could only get low sodium/low fat/low cholesterol foods through your doctor! This is a financial marketing ploy to get vets to says Science Diet is the best food. Some of them actually believe it. I am not so cynical as to believe that all vets are calculating and deceptive for financial gain by categorically dismissing the health benefits of home care and anesthesia-free dentals cleaning. Perhaps they truly have convinced themselves that dogs can't be managed without anesthesia. They might be fine doctors but not necessarily a true Dog Person. They go to school to be study animal medicine and that is all one should expect from them. The same problem is ongoing in the world of dog trainers. There are those who seek to regulate and make a living training Certified Dog Trainers. Many of these come from a core Animal Rights belief system that feels that dogs should be treated just like humans instead of celebrated for their unique dogness. Thank goodness their efforts have been unsuccessful so far because many people understand that the truly great trainers have a natural talent and instinct coupled with a deep understanding and respect for dogs that cannot be regulated, controlled, or taught to just anyone for financial gain, no matter how much of a Dog Lover they might be. Back to the AVDC and the concept of Conflict of Interest. From their website: "The Veterinary Oral Health Council (VOHC) awards its Seal of Acceptance to products that successfully meet pre-set criteria for effectiveness in controlling plaque and tartar deposition in dogs and cats. The VOHC is an entity of the American Veterinary Dental College." The list of products that have received their Seal of Approval doesn't contain a SINGLE dentifrice to be used with brushing. Only "premium" brand pet foods (mostly Science Diet! ), chew treats and one water additive. "1. Dental tartar is firmly adhered to the surface of the teeth. Scaling to remove tartar is accomplished using ultrasonic and sonic power scalers, plus hand instruments that must have a sharp working edge to be used effectively. Even slight head movement by the patient could result in injury to the oral tissues of the patient, and the operator may be bitten when the patient reacts." I've done hundreds of anesthesia-free dental cleaning without injury to self or patient. Oral tissues are also subject to injury while a dog is under anesthesia. All it takes a brief moment of carelessness or slip of hand. I've also found that I actually do a better job when the dog is awake because I can get a better grip and leverage with hand tools without the intubation tube in the way. I do not use ultra sonic scalers as I was advised by the Pacific School of Dentistry's Advance Dentistry Dept that ultrasonic scalers have been found to be damaging to the enamel. "2. Professional dental scaling includes scaling the surfaces of the teeth both above and below the gingival margin (gum line), followed by dental polishing. The most critical part of a dental scaling procedure is scaling the tooth surfaces that are within the gingival pocket (the subgingival space between the gum and the root), where periodontal disease is active. Because the patient cooperates, dental scaling of human teeth performed by a professional trained in the procedures can be completed successfully without anesthesia. However, access to the subgingival area of every tooth is impossible in an unanesthetized canine or feline patient. Removal of dental tartar on the visible surfaces of the teeth has little effect on a pet's health, and provides a false sense of accomplishment. The effect is purely cosmetic." Dogs can be trained to cooperate if you have the talent and patience for it. The only teeth that can be difficult to reach are the insides of the molars. Fortunately, the insides of the molars are the last place most dogs will get tartar or recession because the dog's tongue and saliva keeps that area clean. By the way, small wiggly children and adults with severe learning disabilities aren't always cooperative but have their teeth cleaned all the time without anesthesia. 3. Inhalation anesthesia using a cuffed endotracheal tube provides three important advantages - the cooperation of the patient with a procedure it does not understand, elimination of pain resulting from examination and treatment of affected dental tissues during the procedure, and protection of the airway and lungs from accidental aspiration. The next time my boyfriend is pestering me I'll be sure to drug or use a stun gun on him to make him "cooperative", ha! Dogs may not understand what you are doing but they can quickly learn to trust you. There is no reason for a routine anesthesia-free cleaning, (including the sub-gingival margins) and examination to be painful. If accidental aspiration is such a risk why aren't endotracheal tubes used when our teeth are cleaned? I always inspect these areas for tartar and recession and recommend an anesthesia dental when indicated. I also recommend that home care involves working up to brushing the insides of the molars. I've been able to build up the level of trust required to scale the insides of the molars as well with many patients. The minimal tartar usually found there is rarely even at the gum line. Now here is a good question: what kind of examination would a veterinary dental specialist recommend for the client who diligently and thoroughly brushes their dogs teeth daily...hum? Further on in their position statement it reads: To minimize the need for professional dental scaling procedures and to maintain optimal oral health, the AVDC recommends daily dental home care from an early age. This should include brushing OR (my emphasis) use of other effective techniques to retard accumulation of dental plaque, such as dental diets and chew materials. Not much of an emphatic recommendation for daily brushing. Shame on them. Isn't what you're doing unethical and illegal? "In the United States and Canada, only licensed veterinarians can practice veterinary medicine. Veterinary medicine includes veterinary surgery, medicine and dentistry. Anyone providing dental services other than a licensed veterinarian, or a supervised and trained veterinary technician, is practicing veterinary medicine without a license and shall be subject to criminal charges. Okay, so according to them, a "supervised and trained vet tech" can practice Veterinary Medicine Without a Veterinary License? The AVDC accepts that the following health care workers may assist the responsible veterinarian in dental procedures or actually perform dental prophylactic services while under direct, in the room supervision by a veterinarian if permitted by local law: licensed, certified or registered veterinary technician or a veterinary assistant (unlicensed, and my emphasis) with advanced dental training, dentist, or registered dental hygienist. The AVDC considers it appropriate for a veterinarian to delegate maintenance dental care and certain dental tasks to a veterinary technician. Tasks appropriately performed by a technician include dental prophylaxis and certain procedures that do not result in altering the shape, structure, or positional location of teeth in the dental arch. (my emphasis) The veterinarian may direct an appropriately trained technician to perform these tasks providing that the veterinarian is physically present and supervising the treatment. I realize that some of these statements are rather fuzzy... Vets usually have unlicensed technicians clean teeth. Why, because it's legal and you can pay them minimum wage. So does Cleaning Teeth equal Practicing Dentistry? Is your own dental hygienist a DENTIST? No. I have spent many years in the advanced dentistry dept at University of the Pacific. One high level instructor admitted that not allowing dental hygienists to work outside of a dentist office was a political control issue and baloney. Another high level instructor brought his dog to me. The AVDC understands that individual states have regulations that govern the practice of veterinary medicine. This position statement is intended to be a model for veterinary dental practice and does not replace existing law. I've read several statements by online vigilantes, who apparently have a lot of time on their hands, that referred to this document as if it were a legal document, which it is not. I work under veterinary supervision so I can be perfectly legal in the state of CA. This makes the cost go up accordingly. As far as "ethical" goes, I challenge ANYONE to see my work and meet my clients and their dogs. 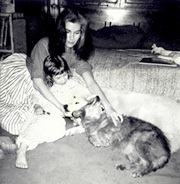 As I was growing up I spent most of my time with the dogs who were non-judgmental, affectionate, and good listeners. In 1988 I got involved with a breed notoriously prone to gum disease. The status quo for Italian Greyhound dental care at that time was weekly brushing and yearly anesthesia dentals. Tooth loss was considered normal and inevitable. Vets would say, "It's just the breed." and I just wouldn't accept that. In 1990<? !> I found Dr. Egri at Harbor Veterinary Services, who insisted that I restrain my dogs for procedures as the well-meaning, but inexperienced, vet techs could easily drop a fiercely squirming IG and break their leg. After many years of a mutually respectful doctor/client relationship I went to work for him and he soon recognized my skill at keeping strange dogs calm while securely restrained and encouraged me to do anesthesia-free dental cleanings at his clinic. I bring 25+ years of canine behavioral and training expertise to the Houndstooth & Nail clinic at Harbor Veterinary Services. several educational articles on responsible pet ownership, canine care and training and hold tooth brushing clinics by special arrangement. In 2002 I co-founded and managed an award winning Italian Greyhound re-homing service, CIGRescue, which re-homed IGs until 2005. The CIGRescue site remains up as a resource for people in dire need of IG training advice and as a bulletin board for lost Italian Greyhounds in California. Do you train others to perform anesthesia-free dentals? No. Natural talent and instinct for calming and restraining a large variety of dog temperaments by gaining their trust cannot be reliably taught to just anyone. Many groomers and pet stores offer anesthesia-free cleaning and just like licensed veterinarians and vet techs, not all practitioners are created equal! I have heard of ones who said it only took 20-30 minutes to do a dental cleaning. Seeing the results of their efforts, I wasn't impressed by their thoroughness. Some are only brushing the teeth which a pointless waste of money unless you take the dog there every day. Ultimately you will have to use your own judgment but beware of practitioners who don't stress the importance of home care, aren't able to help you effectively brush your dogs teeth through demonstration, stresses the horrors of anesthesia risk, or has a policy of not allowing the owner to observe. Through education, consumers will learn how to separate the chaff from the wheat and the bogus practitioners will not stand the test of time. Inadequate attention to nails can lead to permanent conformation problems, early arthritis and sometimes, serious crippling. Symptoms to look for are splayed toes, flattened feet, breaking down of pasterns, rear legs carried too far forward and rear locomotion which lacks drive. When dogs are uncomfortable exercising, they tire more easily. Less exercise shortens life span and is detrimental to physical and mental health. Overgrown nails can contribute to leg breaks in fragile boned breeds. I have always used clippers on my dogs nails and my last dog lived to be 18, why do you prefer using a grinder? Trimming nails with clippers tends to remove too much nail (causing pain and bleeding) or not enough nail. This is especially problematic for dogs with black nails. With a grinder you can safely and painlessly keep the nails as short as necessary for optimized physical well being. Nails should obviously clear the floor when the dog is standing freely. Nails should be done before they look like they need to be done. Going by this rule, the nails will only take a couple of minutes to grind if done 1-3 times weekly, depending on nail growth. The only dogs I've seen that kept their nails clearing the floor when free standing were heavier breeds that dragged their owners down the street. These dogs will do an extended swimming movement with their front legs and get lots of contact with concrete. These are dogs that are out of control, don't respect their owners and need some basic obedience training. Wild dogs don't have the potential life span that our domesticated dogs do.